The weekend is winding down, but I'm already excited for the next one. I'll be done with classes and homework, I'll have more time to cook, and it will be Cinco de Mayo. Even though my friends are going all out at the bars, I know the real fun is with the food. There's nothing better than a party with a taco bar, and don't forget the salsa and guacamole. As for dessert? 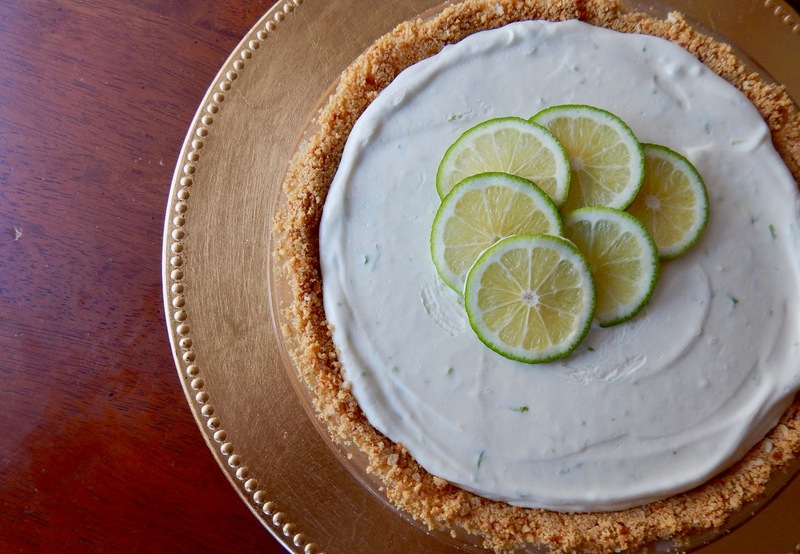 This frozen margarita pie is like the best key lime pie that made a pit stop at the bar. 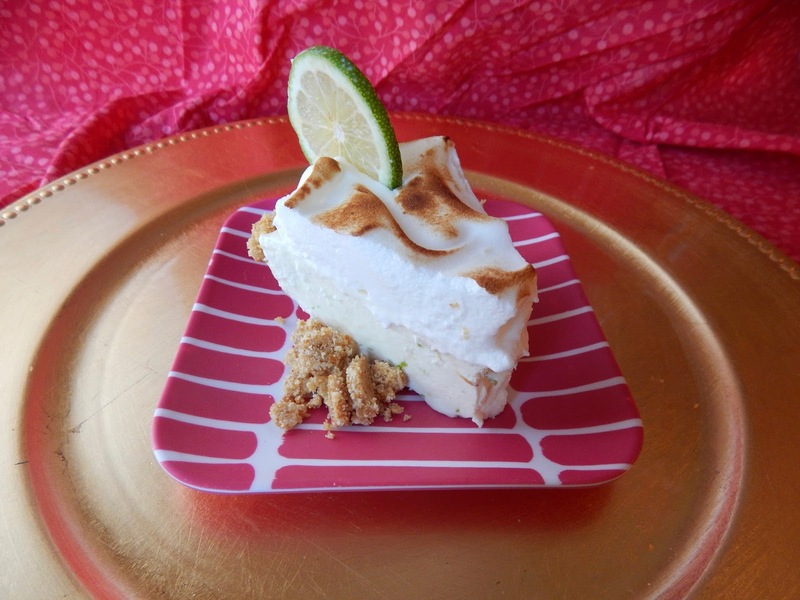 It has a bright, citrusy lime filling spiked with tequila cradled in a sweet and salty pretzel graham cracker crust, all topped with a torched meringue topping. 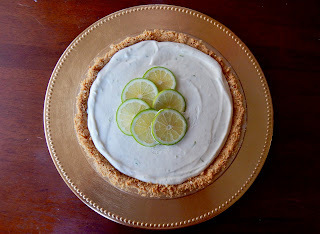 Normally I prefer a graham cracker crust for my custardy pies, especially the lime ones. I didn't stray too far off with this recipe, but I did add a secret ingredient: pretzels. They maintain the crunch and add some notable saltiness, which contrasts well with the sweetness and the tartness of the rest of the pie. 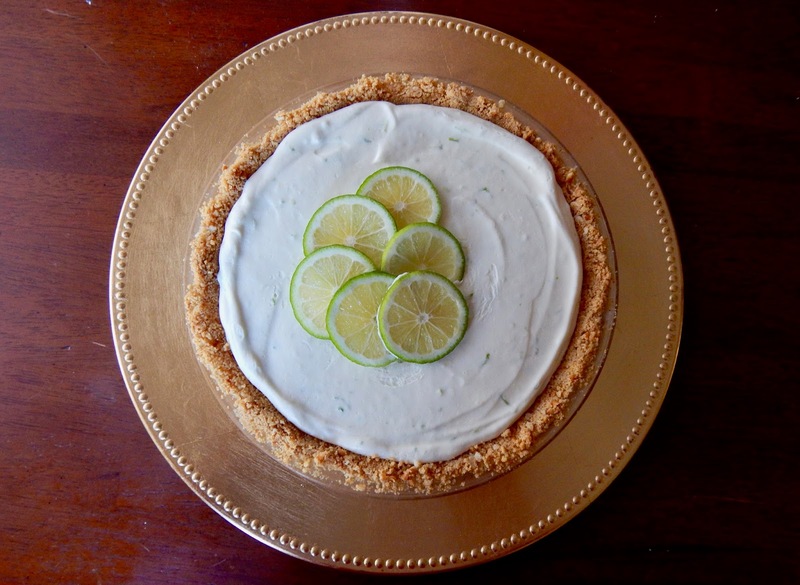 Also, margaritas need salt and this is easily the tastiest way to incorporate it into the pie. I use the same method as a homemade graham crust: pulse the graham crackers (and pretzels) in a food processor until fine, add some sugar and melted butter, and quickly press into your pie plate. I pop it in the oven for a few minutes to firm up and toast a bit, then let it cool until the filling is ready. The filling is surprisingly easy compared to other pies. 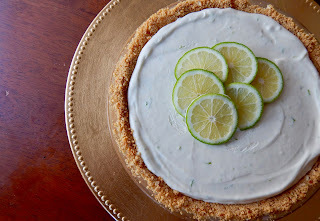 I combine sweetened condensed milk, lime juice and zest (no need for key limes here unless you really want them), a splash of orange juice, some sugar, and, of course, tequila. I've made this recipe with other citruses and other (or no) alcohol, but I've found that the combination of lime and orange is unbeatable, and you really need the tequila to capture the essence of a margarita and hold on to the spirit of Cinco de Mayo. That all yields a very tasty but poorly textured filling, so I combine it with some stiff whipped cream to make a mousse-like filling. I prefer it frozen for a few hours to firm up and provide more textural contrast since you'll also have the fluffiness of the meringue. The meringue is also very straightforward. 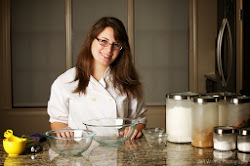 I whip egg whites with some cream of tartar to stabilize them until soft peaks form. I then add some sugar and whip until the peaks turn stiff and glossy. There's a lot of debate about when to add the ingredients, how fast to whip the eggs, what order to do everything in, etc. but I've found that this turns out just fine. 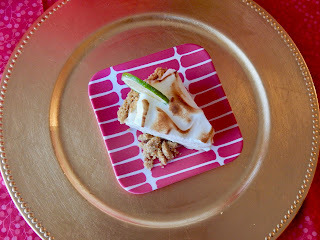 For some extra pizzazz, I broke out my new kitchen blowtorch and toasted the swirls of meringue. 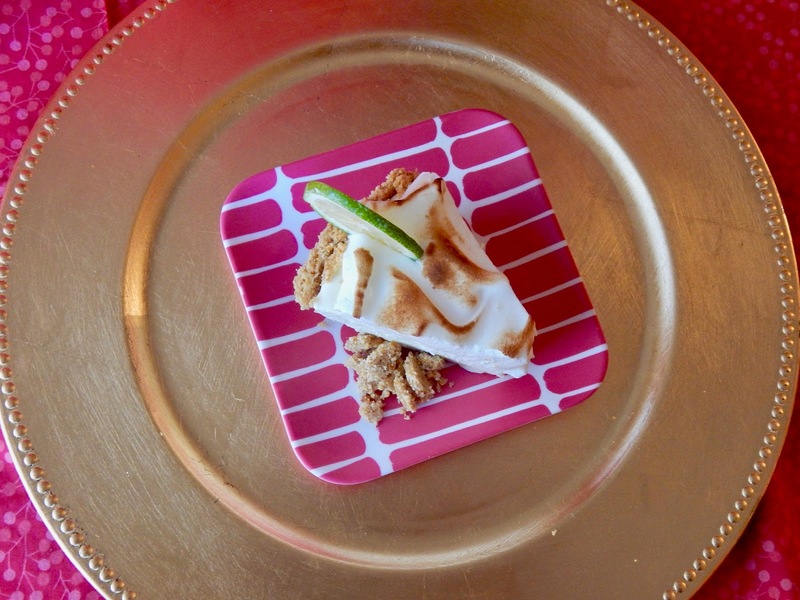 It adds that nice toasted marshmallow-y flavor and makes the dessert truly show-stopping. This could also be achieved by broiling it very carefully for about a minute on the top rack of your oven, though it runs the risk of melting the filling. 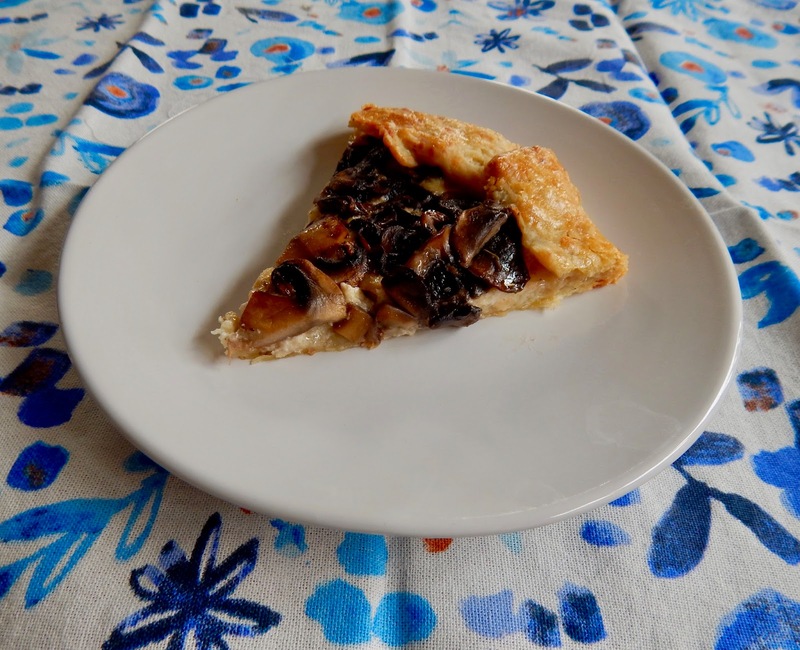 If you've more risk-averse, this pie is still very tasty without the topping. If this pie isn't enough, I have plenty more recipe ideas in my recipe index, so make sure to look for more dips, salsas, tacos, and other mains. I'm not sure what else could top this pie, but I'm sure I'll come up with something eventually. For now, enjoy this creamy, cold, refreshing dessert, and I'll get back to you soon. Heat oven to 350F. Grease a 9" pie plate. Pulse the pretzels in the bowl of a food processor until only small bits remain. Add the graham crumbs and 1/4 cup sugar; pulse a few times until sandy. Add the melted butter. Quickly press into the prepared pie plate. Bake for 6-8 minutes or until set. Set aside to cool. Whip the cream until it holds stiff peaks. Set aside. Whisk the sweetened condensed milk, lime juice and zest (1/2 cup lime juice, 2-3 T zest), orange juice, tequila, and 1/4 cup sugar together. Gently fold in the whipped cream in 3 additions. Spread into the cooled pie crust and freeze until firm, at least 2 hours. 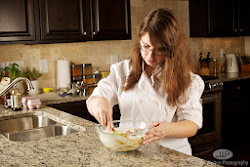 In a clean bowl, whip the egg whites and cream of tartar together on medium speed until they reach soft peaks. Gradually add the remaining 1/4 cup sugar and whip until stiff, glossy peaks form. 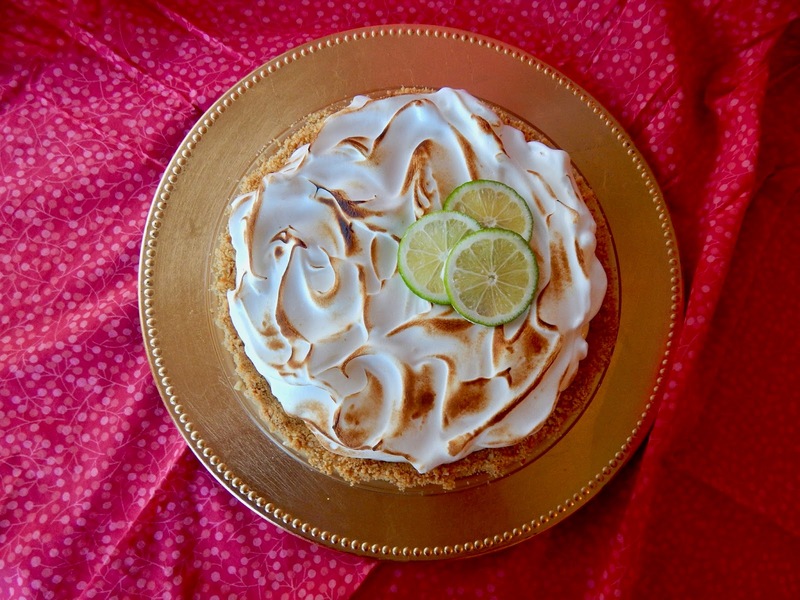 Spread the meringue onto the pie and toast with a kitchen torch or under the broiler for 1 minute or until golden. It's finally spring! The forecast is above freezing for the next 10 days, the farmers market is open, and Earth Day is tomorrow so I feel obligated to eat somewhat healthy. Also, I graduate in 3 weeks so my clearing-out-the-apartment diet is in full swing. Is there really a better time to write a recipe for an easy appetizer made with fresh veggies and all the cheeses and butter and baking staples I'm trying to get rid of? I realize these are fairly unique circumstances but I think everyone could use a good appetizer idea (or side or light dinner or even breakfast, if we're being perfectly honest here). 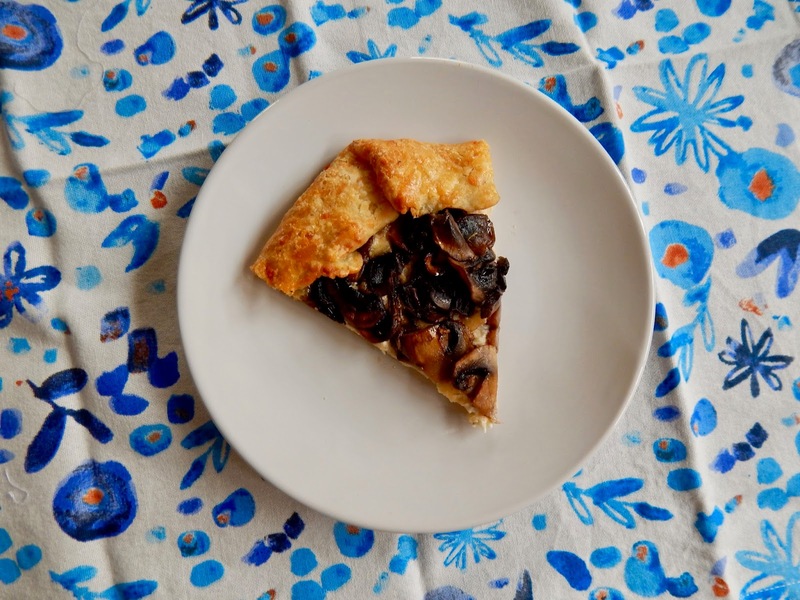 This mushroom galette has a creamy, cheesy layer topped with piles of savory mushrooms all on a buttery, flaky pie crust with a secret ingredient. Yes, the crust also has cheese in it. You're gonna love it. I suppose I should mention that a galette might sound like a scary challenge that is easy to mess up, but it's quite the opposite. A galette is a free-form tart, so you essentially spread the filling on to a big round of crust, fold the sides up, and pop it in the oven. You can easily transfer it to a tart shell if you aren't going for that rustic look. I adapted my regular savory pie crust recipe to fit the flavor profile of this galette. It still has all of that buttery flavor and delicate, flaky texture, and it also has the nuttiness and richness of good gruyere cheese. As with any pie crust recipe, keep everything cold and handle it as little as possible and it will turn out just fine. Keep it chilled in the refrigerator until the filling is ready so it's easy to roll out and the flour has a chance to hydrate. The mushrooms are pretty simple to let their flavor shine through. As with many of my go-to mushroom dishes, I typically use baby portobellos or button mushrooms. However, there are plenty of other amazing varieties out there, so see what looks good at your grocery store or farmers' market, and don't be afraid to mix a few together. I cook them with some garlic and thyme until a lot of the moisture cooks off because I don't want it to puddle out and ruin the cheesy filling. There is a delicate balance since they'll be cooked again in the oven and you don't want them to disappear entirely, but I've found that 6-8 minutes does the trick. 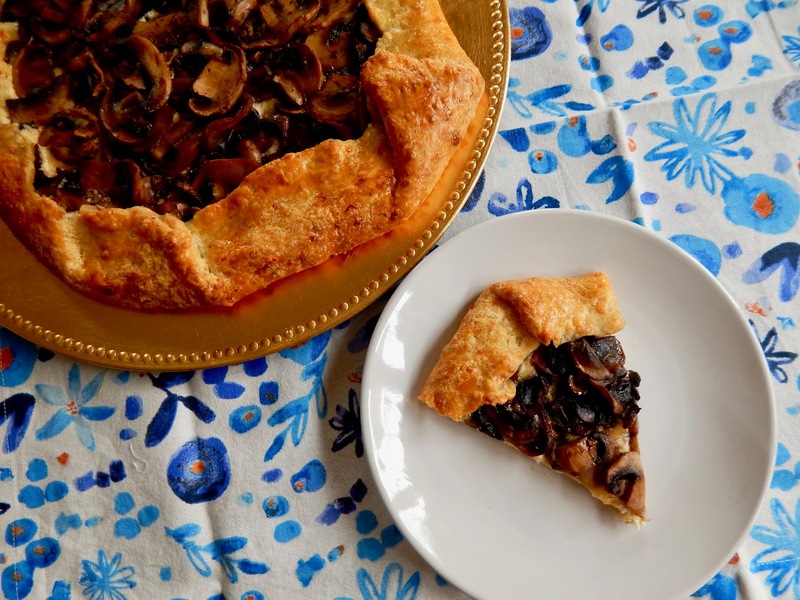 The cheese layer gives some bulk and textural variation to the galette. I combine cream cheese, parmesan, and gruyere for the perfect creamy, melty texture and nutty, sharp, slightly tart flavor. It matches the gruyere flavor in the crust and is pretty hard to mess up: just combine softened cream cheese, parmesan, and shredded gruyere and season to taste. To assemble the galette, I roll the pie crust out to a very thin circle. It doesn't matter if your circle is inevitably lopsided because it will be folded onto itself anyway. I aim for 1/4" thick so that it holds up to the filling without breaking but still cooks through. It's easiest to transfer the crust to your baking tray here (even if it's too big and hangs over the sides) because the assembled galette is nearly impossible to transfer while raw. I spread the cheese filling in the center up to about 1-2" away from the edges; it is important that your cheese is soft and your crust is cold to avoid any tearing or rips. The mushrooms get spread on top of the cheese (you should have a pretty full but even coverage with no gaps) and that 1-2" border gets folded over to hold everything in. I like to brush a quick egg wash over the sides to get a golden, glossy sheen. After about 40 minutes in the oven, your galette is ready to serve to graduation guests, friends, family, fellow farmers' market lovers, or just your fridge if you feel like indulging later. Pulse the flour, sugar, and salt together in the bowl of a food processor until combined. Add the butter, 2 oz (2/3 cup) gruyere, and 1/4 tsp thyme and pulse until small lumps remain. Whisk 1 egg and 1 T cold water together, then add and pulse until it just clumps together. Wrap in plastic wrap and chill until firm. Heat a large skillet over medium heat with the oil and 1 T butter. Add the mushrooms and garlic. Season with salt and pepper and remaining 1/4 tsp thyme. Cook for 6-8 minutes or until softened. Combine the cream cheese, parmesan, and remaining 4oz (1 1/3 cups) grated gruyere. Season with salt and pepper. Roll the crust out to 1/4" thick. Transfer to a parchment-lined cookie tray. Spread the cheese mixture onto the dough, leaving a 1-2" border. Spread the mushrooms on top. Fold the edges of the crust over. Whisk 1 egg with 2 tsp water and brush onto the crust. Bake for 40 minutes or until golden. I'm feeling pretty conflicted right now, and it's surprisingly not because I have to graduate in a few weeks and enter the real world. No, it's because it's April and the outdoor farmers' market starts next week and, of course, it's supposed to snow tomorrow. I can't keep up with this crazy flip-flopping weather (sadly, no more flip flop weather since spring break ended last week), and it's confusing my diet as much as my wardrobe. It seems like one day I'm needing a cozy bowl of hot soup to warm me up and the next Spring is peeking through and I want to break out all my fresh springtime recipes. Chicken Marsala is traditionally a lightly breaded chicken cutlet with a luscious Marsala wine and mushroom sauce. It's a great weeknight dish since it can be made fairly quickly and is just the thing to keep your warm and full. So how can you make it better? I'm always up for some pasta, and some extra bacon never hurt anyone. I crisp up some bacon, cook the chicken in the drippings, and make a mushroom and Marsala pan sauce. 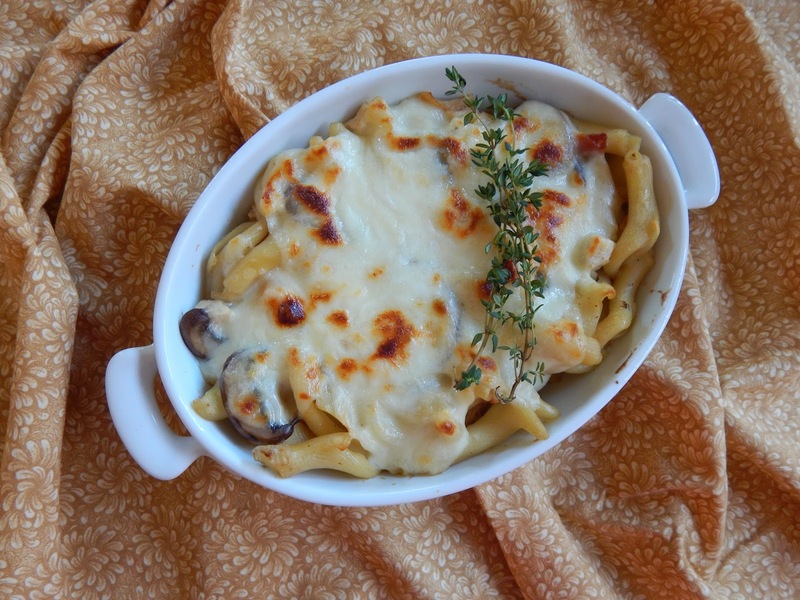 That velvety sauce gets tossed with the chicken, pasta, and plenty of cheese for a tasty spin on an Italian classic. Most chicken in Chicken Marsala gets dredged in flour and pan-fried, but here I take advantage of all that flavorful bacon fat for just a quick sear. Thin boneless, skinless chicken breasts work best for quick cooking, and they can be easily cut up into bite-sized pieces for easy eating. The sauce is built on the drippings of the bacon and chicken, since those brown bits are the key to a well-rounded flavor. I start with onions then add garlic, herbs, and plenty of mushrooms. 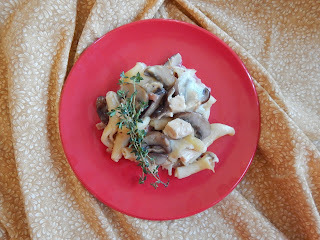 I typically go for sliced baby portobellos, but crimini, porcini, or whatever mushrooms you can find would also work. I deglaze the pan to scrape up the last of those brown bits, and of course you have to use Marsala wine here. Anything else would give you a perfectly delicious sauce, just not Chicken Marsala. Once the alcohol cooks off, butter and flour help to thicken the sauce, and I whisk in some chicken stock to achieve a silky texture that's just liquidy enough to coat the pasta. 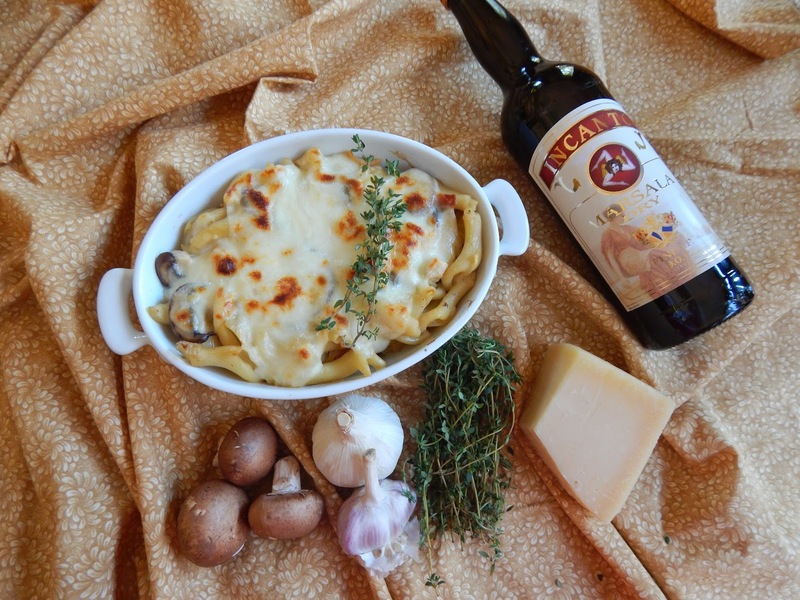 I'm not particularly picky about which pasta to use here, but I do prefer one with lots of twists and turns and nooks and crannies to catch the sauce, the bacon, and the mushrooms. I cook the pasta until barely al dente since it will cook more in the oven and I still like it to have some texture. The cooked pasta is tossed with the sauce, chicken, bacon, and cheese and is topped with even more cheese. Since everything in the dish is already cooked, it only needs a little bit of time in the oven to melt the cheese and give the flavors a chance to meld together. 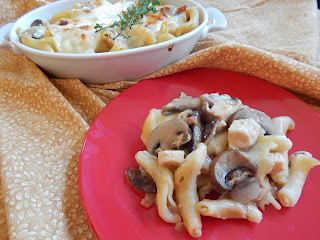 It's a little more portable and rounded than a typical Chicken Marsala, so you'll want to make it for weeknight meals and leftover lunches all Spring. Heat oven to 375F and grease an 11x7" baking dish. Cook the pasta in salted water until al dente according to package directions. Cook the bacon in a large pot until crisp. Remove and chop. Season the chicken with salt and pepper and brown in the bacon drippings until golden, about 4 minutes per side. Transfer to the prepared dish and bake for 8 minutes or until cooked through. Shred or dice when cool. Cook the onion in the drippings for 4 minutes or until tender and fragrant. Season with salt and pepper, then add the garlic, mushrooms, and thyme. Cook for 8 minutes until the liquid evaporates. Add the marsala and cook for 6 minutes or until reduced. Stir in the butter. Once melted, add the flour and cook for 3 minutes or until thick. Slowly whisk in the chicken stock and cook for 6 minutes. Add the chicken, pasta, and 1/3 cup parmesan. Transfer to the prepared dish and top with the mozzarella and remaining parmesan. Bake for 18 minutes or until golden and bubbly.